In 1992, I was a corporate executive who was between positions. I decided to take a month break before starting a new position. It was during this time, I met Forte. I happened to be sitting in the kitchen nook at a friend’s house when outside the window, an animal control vehicle had just arrived. As a born animal lover, I automatically stepped out and went over to see what it was about. An officer was talking with a lady who had apparently called the animal control. I approached her and asked her why in the world she had to call the animal control. She said that for the past few weeks, the stray dog was roaming around and eating her cats’ food. She thought that the animal control was an agency that would care for such animals until a home is found. When I told her that many dogs are killed on a daily basis in the pound, she began asking me to take the dog. By law, the officer could not allow it, and the dog was taken away. As soon as his holding period was over, I bailed him out of the pound. As this was in 1992, there was no Internet, and I had no knowledge of rescue groups. Being a 120-pound “beast,” I believed he needed a big yard. As I had a townhouse with no yard, I was determined to find him a better home. The first home I found for him could not handle his “beastliness” (he was huge and feral-like), so he came back. The second home I found for him was a great one with an acre yard, a family consisting of husband, wife, 4-year-old daughter and grandma. The husband was even able to take Forte to work. “Pretty good life for him,” I thought. Though I couldn’t shed the last look Forte gave me, I was convinced it was the right thing to do for him. A week passed and the guy said all was well. His daughter was enjoying him, calling him “BearBear Forte.” Ten days passed, and while I was feeling a sort of anxiety in my heart, the logic of it all overpowered it, and I let go of the nagging feeling. On the twelfth day, the guy called to tell me his wife was having a fit because Forte tore apart the entire living room: their couch, love seat and brand new expensive reading chair. He broke them all down to pieces. On top of it, he said Forte was not opening up to him at all. “He is here, but his soul is elsewhere,” said the guy, and he didn’t feel bonded enough to work through the problem. Once again, Forte was returned to me. Though I felt relieved to have him back, I still reasoned he needed a yard. My search continued, but to no avail. In the meantime, I declined the high-paying executive position I was supposed to start because I had to walk him five times a day to compensate for the lack of a yard. The gigantic “beast” had to be trained before I could have someone else, even a professional dog walker, walk him. I hired a number of trainers because he was untrained in all aspects as if he was freshly out of the woods. I also knew that I had to become savvy and keen about various training methods, to create a formula specifically designed for Forte, in order to be an effective guardian of a dog of his size and strength. During this phase, he continuously had the worst diarrhea. He, however, never touched any of my furniture, nor even my shoes if I had accidentally left them out. But the beastliness and the diarrhea continued. From that very moment, his diarrhea stopped, and he never made a mistake inside ever again. He became responsive to training, and in time he turned out to be the majestic figure in my neighborhood. He was so regal that everyone admired him. His everything changed. With good food and exercise, he developed a masculine body with the most gorgeous coat that received countless compliments. In retrospect, he wanted to be with me even if I lived in a dungeon. While I was his fulltime caretaker, I began receiving calls from those who knew me in the industry my career belonged to. They asked if I would consult with them. Before I knew it, I was able to pay my mortgage. If it weren’t for Forte, I would not have established my own business. Since 1992, I have been consulting to businesses around the world. This completely shifted my path in life. In our journey together, Forte taught me life was not all about climbing the corporate ladder. He also showed me how to appreciate every moment in life, especially through his final year he spent in the wheelchair. He became paralyzed from his waist down. Taking care of Forte was particularly difficult for me because he was 40% larger than I. Also challenging was not to waste my energy on hating the veterinarian who purposely misinformed me about his diagnosis, so that he could cut him open and play a “surgeon” (which he was not). As this man was taking Forte to the operating room, I felt inside, “No, wait!” But I felt my action would be groundless, so I did not let my inner voice speak. Yet, as I could not forget this feeling, I later visited other veterinarians for their opinions, and they confirmed my intuition with correct diagnosis and told me that the surgery should not have been conducted for his conditions. I had choices: Sue the veterinarian spending all my available time, resources and energy; or spend them on good cause. I did want to spare other animals this unethical veterinarian, but I learned that I would be merely fighting against his insurance company, and while I may retrieve the thousands of dollars I spent on him, my efforts could not stop his despicable practice. I did not want this man or his misconduct to consume my soul, and I still had Forte to care for, so I chose the latter. I took time off from work because I did not want to leave him on business trips, as I knew he would not be around for too long. I started volunteering for a few rescue groups that needed my help. After his passing, I became more active in animal advocacy. How did Forte Animal Rescue start? I often joke that I was “framed,” but in a sense it’s true. As I was already volunteering for other groups, I knew how much work and money were required, and I always said that I would never, ever, want to be the head of a rescue group. When Forte Animal Rescue was established, I was only there to help them. Nonetheless, the group was named after my late dog, and I was already listed as its leader. The essence of Forte remains in the hearts of those who crossed his path. Today, the tangible Forte is gone, but I believe that every time we accomplish certain rescues which appear to be impossible, it is the energy of his spirit that enables those miracles to come true. Among all he has taught me, this notion became my mantra: “Let the compassion be my force.” When cruelty of humankind angers me, I try turning its energy to compassion, and then a miracle follows. This is what continues to give me the strength to keep going, especially when I feel defeated by the lack of support for the endless need of help. Despondency and anger are ingredients in animal rescue due to constant dealing with people’s selfishness, abuse, and shifts in priorities. This is a difficult test for anyone’s state of being. Our strength has to be derived from compassion for the animals (including humans), instead of hostility or resentment toward people, no matter how frustrating they may be. When we operate with the power of compassion, it allows Forte’s eternal love to visit upon us, and we will become one with the universe, in which moment, an impossible rescue becomes possible. A lot of rescued dogs end up changing their guardian’s lives in unexpected, miraculous and wonderful ways. 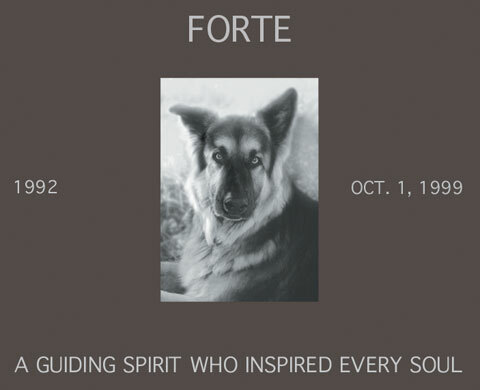 Forte was Marie’s muse and inspiration, and we at Forte Animal Rescue strongly believe that the animals we save have the same power, the same wonder, that Forte had. A lot of our past adopters could tell you similar stories with the dogs they adopted through us, as we hope there will be many future stories of the rescued dogs that will change their lives for the better. If this is something that you, too, feel in your heart, please contact us to meet our dogs or to donate to help us save some of the most wonderful creatures on the planet and to help people find their own personal muses.